Growing up on the farm I’ve been around the challenges of breeding a variety of animals since a very young age. I remember the sadness from seeing tiny hooves of a baby donkey sticking out of a feed sack. The baby was born breach and didn’t make it through a difficult delivery and mom required surgery to ever delivery successfully again. At the age of nine my dad spared me the sight of my first litter of rabbit babies that were born on the wire of the cage instead of the nest box and as a result died in the cold. Through my animal career I’ve learned not all male or female animals will reproduce, not all mothers instinctively know where to deliver or how to care for young. Mothers can die at birth or shortly after birth from complications and babies can die because the mother can’t or won’t nurse them properly. As a human mom I’ve personally learned what a miracle it truly is to conceive and carry a baby successfully through birth. Even with all the knowledge available in human medicine there is still fertility problems, miscarriages, and infant death. Male hedgehogs have a much higher successful breeding rate than females but even so there are no guarantees that all males are going to be good producers. One lesson I learned from raising cattle and rabbits is that a good herd sire is much more important than an individual female. For many years we have only bought new males to bring in new bloodlines to our herd. At Millermeade Farms we keep detailed records of both female and male reproduction success. Some males only produce a small number of babies and other males consistently produce larger litters. We have found that many males eventually taper off in breeding success with age, but again, that is not always the case. Some males are able to breed for many years. 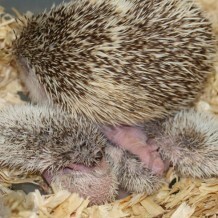 There are quite a few reasons why female hedgehogs do not breed. Obesity and Stress are the two most common reasons I’ve seen in hedgehogs. I found that some of the same information that applies to humans applies to animals. Check out this article. I’ve deleted the portions that don’t seem to apply.